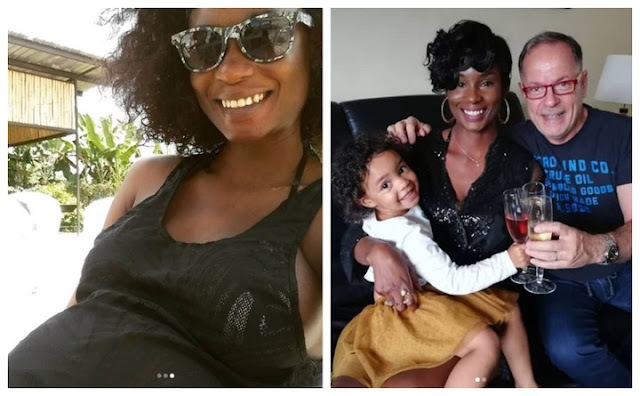 A Nigerian fashion designer, Isi Atagamen Sakalis, has taken to her Instagram page to testify about how she got pregnant despite having 9 fibroid tumors. "Hey lovelies!!! Let me share this testimony. Would you guys believe i was pregnant in this picture and even i had no idea. Fast forward to my pregnancy test and scan... I was told i had fibroid Tumours- about 9 or more of them including one that was 11cm in diameter protuding at the entrance of my Cervix but because we serve a living God, The creator of all creations. Trust God it it will happen just as you have seen it. I don't know what you are trusting or believing God for but i Decree today that Your prayers are answered and desires met. God will meet you at your point of need!! You will have a big celebration in your homes with your mouth filled with Thanksgiving to God. God bless you!! #alifeatatimes #letschangelives #keepspreadinglove"